Last year, coincidentally, Cinco de Mayo fell on the same day as the Kentucky Derby making for a very fine fiesta. My friend Chris threw a “Cinco de Derby” party and I spent a great deal of time at the dollar store conceptualizing the perfect party hat. Onto a big straw chapeau that looked a little too Huck Finn to start, went red, white and green ribbons, a bouquets worth of fake red and white flowers and to really make it special, I glued on a big plastic horse because nothing says “derby” like a large equine sculpture on the side of your head. It was heavy and lopsided due to that horse but I looked rather fantastic. Since the 2013 Kentucky Derby is Saturday May 4th and Cinco de Mayo is Sunday May 5th I think my hat may come out of retirement. It will perfectly compliment a big melted mass of cheese. Is there anything better than melted cheese? I think not. The Mexican version, Queso Fundito, is a damn near perfect dish. Found in certain Mexican restaurants across the country in the “appetizer” column, I order it every single time At my little corner joint I often eat far too much, gooey and stringy, wrapped in warm tortillas. By the time my entree arrives, I’m usually too full to take more than a few bites so it’s not unusual to leave with my nearly untouched dinner in a takeout box. It’s a scene repeated at tables across the country. We – ok, I – never learn. 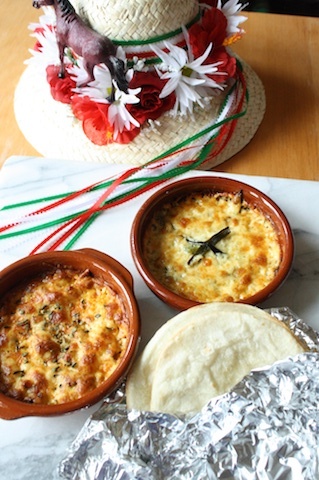 Queso Fundito is a deceptively simple recipe, just melted cheese and some warm tortillas. You might find versions with a little something extra, like roasted poblanos or chorizo but that’s only if you feel like it. That’s pretty much it. Couldn’t be easier and exemplifies how a simple dish, made well, doesn’t need to be overly complicated to be good. The basic assemblage is a 2 minute recipe – shred the cheese, throw it in a dish, pop it in the oven to melt and warm some tortillas. But to start, you need the cheese. The best option is Chihuahua, no question. If you live anywhere near a Mexican community, this is no problem though a fine substitution are other Mexican melting cheeses such as quesadilla or asadero. But if you don’t live near a hispanic community, you probably won’t find those either. If this is the case, I’ve heard Monterey Jack or Colby works but I’ll admit, I’ve never tried it. If you can, seek out the Chihuahua – I find it in my regular ‘ol grocery store – and get the chunk rather than pre-shredded. The shredded stuff is tossed with anti-caking ingredients (corn & potato starches) and it doesn’t melt as nicely. 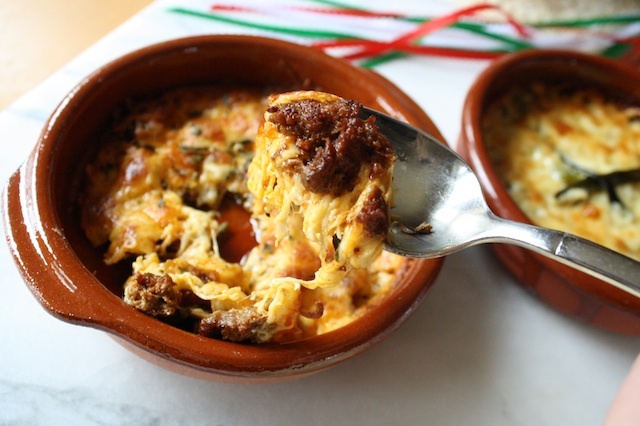 Plain cheese with a pinch of oregano is perfectly wonderful but you could jazz it up with some deliciously oily chorizo, cooked until crispy and bright red in a frying pan. 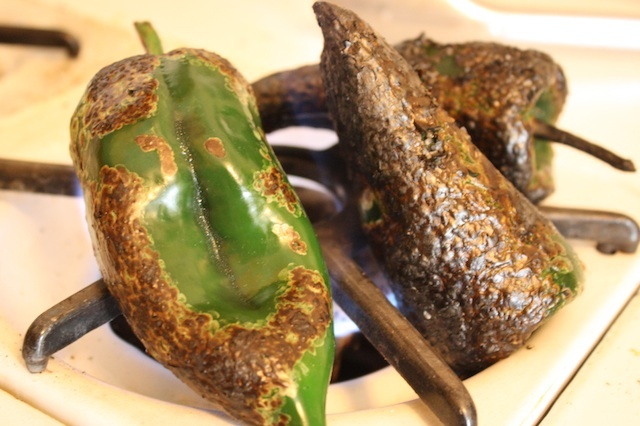 Or you could roast some poblanos, in the oven or right over gas burner until dark and blackened. Scrape off the charred skin and seeds, cut into little strips and you’ve got “rajas”. Mix these beauties together in a dish then bake until bubbly and golden brown. That easy. Next up is the tortillas. If you have a tortelliria nearby, this is no problem. Count yourself amongst the lucky. For the great majority of us who do not have this luxury, we have to rely on the local grocery store. Purchase packages that are fresh and pliable; corn or flour is completely up to you. I tend to go back and forth depending on my mood and what looks good. When the corn tortillas on the shelves are still warm, I have a hard time resisting. You can heat the tortillas a couple ways – right on a gas burner until warm, pliable and ever so slightly blackened is my personal favorite. But for large quantities, like for a party, it’s much easier way to wrap stacks in foil and warm them up next to the melting cheese. Serve this up pronto, while it’s hot, oozy and bubbling letting your guests dig in, wrapping the cheese in the warm tortillas in little taco-like packets. Personally, I adore the crispy edges and will fight you for them. If the cheese cools too quickly, simply pop it back in the oven for a few minutes to remelt. Or better yet, since this can be assembled far in advance, make several smaller dishes and stagger the baking times so there’s a steady stream of hot oozing cheese. I really like the sound of that. STRESS THERAPY BAKING FACTOR: OOZY GOODNESS MAKES YOU HAPPY. Melted cheese. Nothing much else needs to be said. Here’s a hint: make more than seems feasible. I’ve learned that once people start digging in, they don’t stop and your dish is suddently scraped clean faster than you can get your own tortilla into the fray. Besides, what’s a few clogged arteries between friends? A margarita, or perhaps a mint julep depending upon the day, will help too. 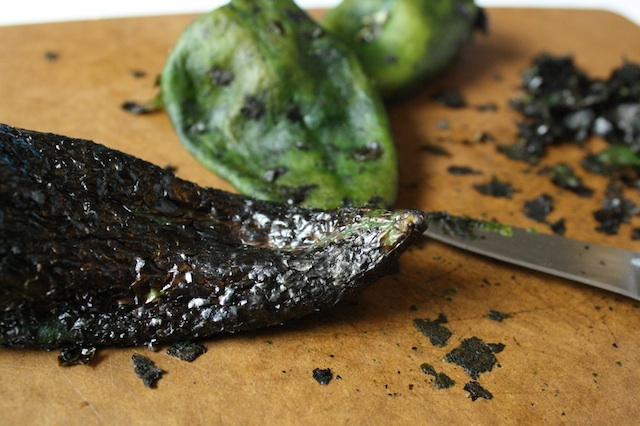 If you’d like to add chorizo or roasted poblano rajas, see the variations below. Check the tortillas to make sure they’re not stuck together then wrap in stacks of no more than 6 in foil, sealing the edges tightly. 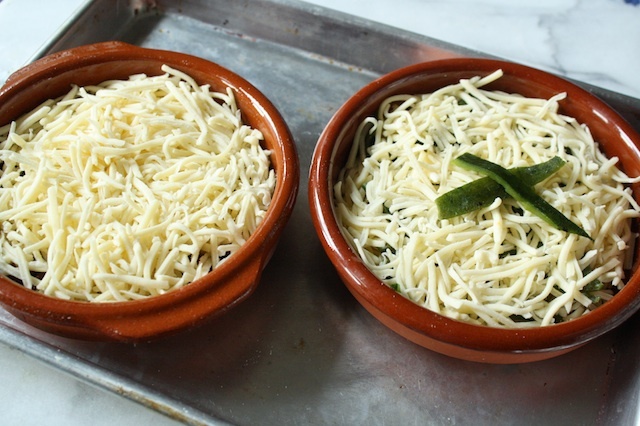 Place the shredded cheese in a 8” baking dish. 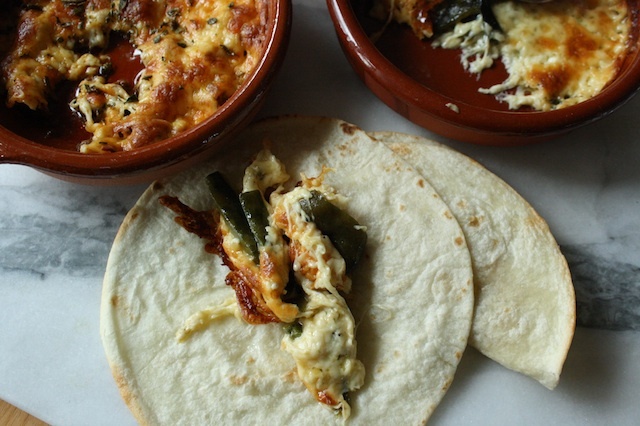 If you’re using chorizo or poblano rajas, place those in the dish first then top with the cheese. Place the cheese in the oven and set the timer for 10 minutes. When the timer goes off, add the tortilla packets alongside, directly on the wire rack, and set the timer for another 5 minutes. Bake until the cheese is just melted and golden but has not begun to separate or look greasy and the tortillas should be warmed through. You may need an additional 5 more minutes . If the top of the cheese hasn’t quite browned, run it under the broiler for a few minutes until golden and bubbly. Sprinkle with the crumbled oregano and serve immediately, accompanied by the warm tortillas. 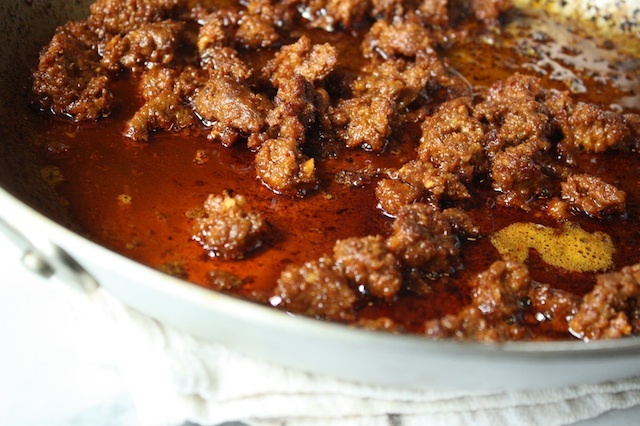 in a heavy skillet over medium-high, fry the chorizo in a dry skillet until it gives off it’s oil and cooks through, breaking up the large chunks as you go. With a slotted spoon, transfer the chorizo leaving the oil behind, to the baking dish. over a burner: place the chilies on an open flame and rotate frequently with a pair of tongs until the skin is evenly blistered and blackened – about 5 minutes. in the broiler: Roast the chilies a baking sheet 4” below a very hot broiler, turning regularly until the skin is evenly blistered and blackened, about 10 minutes. over a grill: preheat a grill to high, place the chilies on grate and rotate frequently with a pair of tongs until the skin is evenly blistered and blackened – about 5 minutes. Place the roasted chilies in a bowl, cover tightly with plastic wrap and set aside for 5 minutes to steam and cool. When cool enough to handle, rub off the blackened skin with the back of a paring knife, then pull or cut out the stems and the seed pods and discard. Tear the chiles open and scrape out stray seeds and any remaining bits of skin. Cut into strips ¼” wide x 2” long. 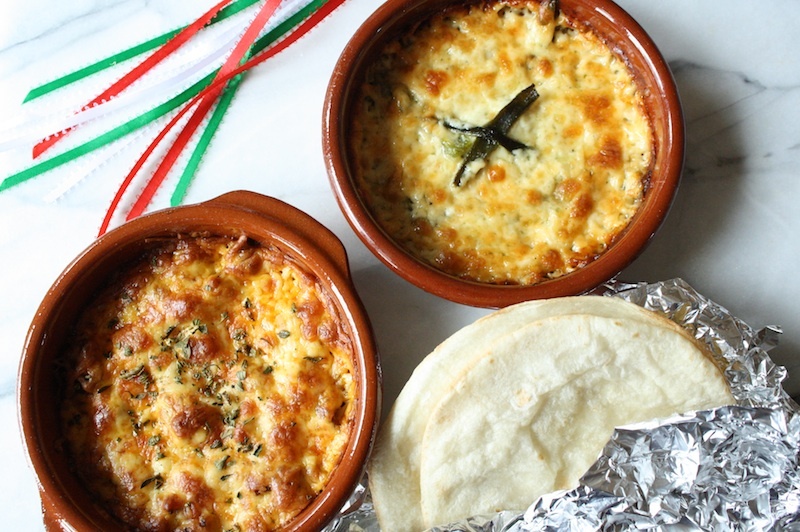 There is nothing better than melted Mexican cheese. So sorry to have missed that fiesta!